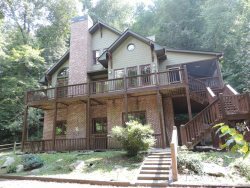 Mountain Resort Cabin Rentals is Located in the North Georgia Mountains in Ellijay. Enjoy The Peaceful Setting of Living in Nature. This is by far the nicest cabin we've ever stayed in. Tastefully decorated and a very comfortable layout. We had a great time and the cabin was all that and more. The best cabin to date. Love Love Love!! We stayed in Serenity for 3 nights in July. We we blown away by how NICE the cabin and resort were. It was totally family friendly. Much more beautiful than we had expected... Very clean and comfortable.. Cabin seemed brand new... We really enjoyed watching the deer while sitting on the porch listening to the crickets, and grilling out on back deck... Thanks to the owner for allowing us to share their cabin and thanks to Mountain Resort Cabin Rentals for making this one of the best getaways we have ever had!!! This cabin is stunning, close to perfect! We were impressed with how well the cabin was equipped in the kitchen with a thousand supplies. We will definitely stay here again! This was a real nice well kept Cabin. Could not have asked for anything more. It was just perfect with the size and the cost was affordable. Met the Owners and they were very helpful with directions and what to do. We are going back. Everything was perfect - the office was very pleasant to work with - the cabin is absolute perfection. Thank you, all was absolutely beautiful and perfect - hope to come back, we enjoyed our stay. beautiful cabin - very nice. Office staff was very nice and professional. Very nice cabin and we enjoyed it. Valerie and Barbara are so helpful. We loved the cabin. Very clean. We will absolutely use Mountain Resort Cabin Rentals again in the future. The woman who helped us with the rental was wonderful! This is amazing - we loved it and everything was GREAT! We hope to be back soon - we felt right at home. Everything was great. The cabin was very clean and accommodating. Office staff was very nice and accommodating. The cabin was very peaceful and relaxing. This is one of the nicest and cleanest cabins weve ever stayed in. Great cabin, loved everything about it. Interior and exterior 5 star. We will definitely be staying with you again! Very lovely cabin! We enjoyed our stay and would choose this cabin again. The housekeeping staff was great!! Very nice and helpful. The cabin was neat and clean when we arrived with a very homey feel to it. We loved it! Extremely well maintained and clean. Family friendly! We loved it! So fun, so clean. Really loved the animal rescue center. This home is clean, beautiful and comfortable. the kitchen is stocked with silverware, plates, cooking utensils, pots and pans, coffee maker etc. we really enjoyed the stay. Hot tub is great, having a fire pit is awesome. We would come back again for sure! We absolutely loved staying in this beautiful home and cannot wait to book again next year. It was perfect for a couples retreat! Thanks soooo much for your help with our recent stay. The cabin was ABSOLUTELY beautiful !! We were lucky to have such an amazing cabin to spend quality family time in. Once again......our stay was amazing and we will return! Along with giving u recommendations to our friends! Our family stayed in Red Feather over Thanksgiving week and we had a fantastic time. Everything was great and the cabin was the perfect fit for us. Thanks for accommodating the dogs and for your time in answering all my pre-vacation questions. I will definitely recommend you to friends! Laura V.